All HIPAA privacy rules are enforced and medical records are held in the strictest confidence by the private RDD Wellness Center. At all times patients are treated and cared for with compassion, respect and kindness. Our physicians are board certified and experienced experts in the field of rapid drug detox. Prior to arrival each patient is properly screened and assessed by our physicians to determine if they are a good candidate and meet the criteria for the treatment. Patients testing positive for cocaine will not be detoxed. Cocaine use must stop 10 days prior to detox. Patients are advised to schedule 7-10 days in advance. All questions and concerns are addressed by knowledgeable medical staff that have many years of experience with our patients and our detoxification program. Scheduled patients receive an informational package which includes a guide for making plans and instructions to prepare for arrival and the detox procedure. Payment is “all-inclusive” at $7,900 and is required at the time of the pre-detox exam appointment. A deposit is never required. Day of pre-exams, patients are seen by our “Board Certified” RDD physician. All patients receive a comprehensive pre-exam which includes a complete physical, extensive blood tests, urinalysis, drug screen, EKG, and other testing if deemed necessary. 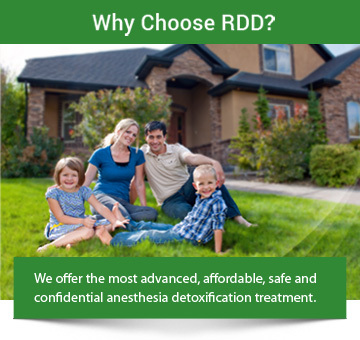 Patients are admitted to our private RDD Unit at our detox facility. Patients receive an anesthesia evaluation by our Board Certified Anesthesiologist prior to undergoing the anesthesia detoxification treatment. All patients are anesthetized by our “Board Certified” Anesthesiologist who is present for the entire detoxification treatment. The RDD physician and our Anesthesiologist are present in the Operating Room for the entire detoxification treatment. Patients are detoxed and fully monitored while under light anesthesia with a slow infusion of FDA approved medications that remove the opiate drug from the patient’s receptors, eliminating the majority of withdrawal. Patients are then given an “IM” shot/injection of the non addicting, non narcotic, non opiate “time released” opiate blocker Naltrexone to prevent the reattachment of the opiate to help with opiate cravings and to ensure sobriety by blocking ingested opiates from having any effect. This injection will release over time giving the opiate blocking protection for 4 weeks. Naltrexone is “not” Suboxone®, not a replacement opiate and does not cause any withdrawal. After the detoxification procedure, the patient is brought out of the anesthesia state and transferred to the RDD post-op recovery room and sedated for 4-6 hours as they continue to be monitored by our skilled nursing staff and physicians. Post detox procedure care includes “one-on-one” private duty nursing care until stable and ready for discharge. Our nurses, medics and our “Board Certified” RDD physician remain with the patient to ensure proper care and expert medical treatment. Medications as needed, IV infusions of vitamins and electrolytes are infused post procedure to maintain patient’s comfort, replenish nutrients and speed the healing process. Patients remain at the facility until stable and are possibly ready for discharge that evening or early the following morning. After discharge from the facility, patients are shuttled to the hotel where they rest in their own private and comfortable room for a few days and under continued observation by our experienced medics and our physician. Patients will receive 24 hour a day “on site” monitoring and medical care by our skilled RDD medics until final discharge to return home. Patients are provided any needed medication to help with sleep, etc. An RDD physician visits each patient daily at the hotel to provide continued care and proper monitoring. Our physician is available 24/7 to visit patients at the hotel and address any concerns. Patients have access to a licensed “masseuse” for daily massages. RDD prescribes a prescription for 6-12 months of the non-narcotic opiate blocking medication Naltrexone to help with cravings and block opiates. Continued 24/7 access to knowledgeable medical staff. RDD provides access to non-addicting medication if patient needs something for comfort, sleep, appetite, energy, etc. Medications are called into the patient’s local USA pharmacy for 30-45 days, if needed. If desired, the Naltrexone Injection is repeated monthly for up to a year. The injection can be sent to the patient for their physician or a nurse to administer. Our patients have access to a licensed therapist who does phone therapy for patients wanting a more convenient, comfortable and private “at home” therapy sessions for as long as desired.